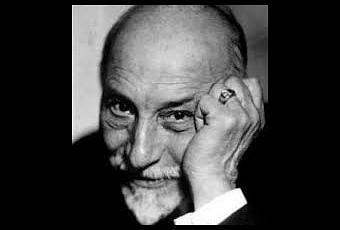 Following the sell-out success of ‘Dinner with Montalbano’ last year, Headingley LitFest in partnership with Salvo's offers diners an entertaining evening with the great Sicilian novelist and dramatist Luigi Pirandello, whose plays include ‘Six Characters in Search of an Author’ and 'Henry IV'. Simone Lomartire and Richard Wilcocks will present and perform extracts from his works, script-in-hand, mainly in English but with a sprinkling of Italian as well. Dishes served for the dinner will, of course, be in the Sicilian tradition. Poet Kirsty Taylor has now completed her series of workshops at Ralph Thoresby School in Holt Park. The group of young poets, who name themselves 'Rebel Writers', have been filmed by Joshua Lewis of Big Dumb Music performing their best pieces of work. Once the final video has been edited and set to music, it will be uploaded on to the school website. Watch this space. It was about mothers and other loved ones in the family, but it began with hands. After reading one of her own short poems, about a dream of a cat, Malika distributed and read out a poem by Lisa Suhair Majaj - 'I Remember My Father's Hands'. 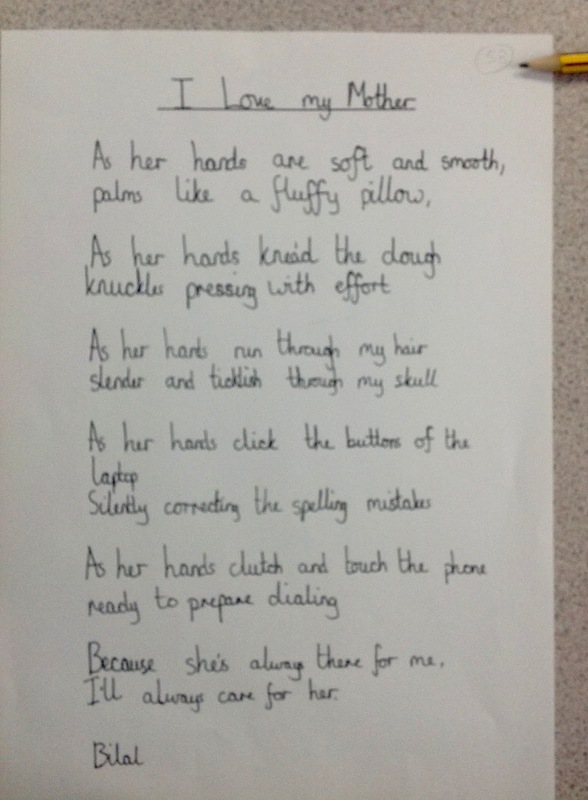 The class (Year 6) drew hands 'of someone you love'. Malika talked with the class about some of the things that mothers commonly say to sons and daughters. Hands shot up. They say plenty, and not all of it telling off. 'This is all a trick!' 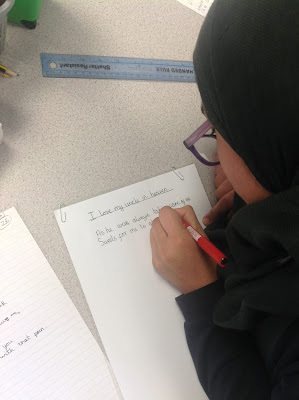 said Malika, 'because I'm gathering ingredients for a poem, like in a recipe.' The hands were soon being filled with the sayings of the loved one. More and more ingredients were added, including similes. Your mum or dad is strong? Like what? A rock, a brick, a boxer, a weight in the gym, a house... the suggestions flooded in. Her hands are soft like what? A pillow, a marshmallow... and so on. What do those hands do? They stir soup, knead bread, form chapatis, open doors, pull the cords of blinds... and so on. 'This is turning into a list poem,' said Malika. 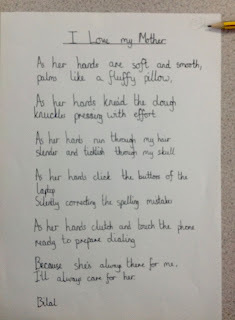 On finale day, the class had the poems ready, thanks to class teacher Julia Rawlinson, all now in best handwriting, and they were taken into the hall for a rehearsal, for performance later on to any parents who could make it. Malika coached them. It was all about building confidence, encouragement with 'well done' for all. Voices had to be raised, projected: 'I know you've got a bigger voice than that! What's the voice you use in the playground? Let's hear it!' And keep still when you're waiting your turn - no rustling of paper.' Loosening-up exercises followed. 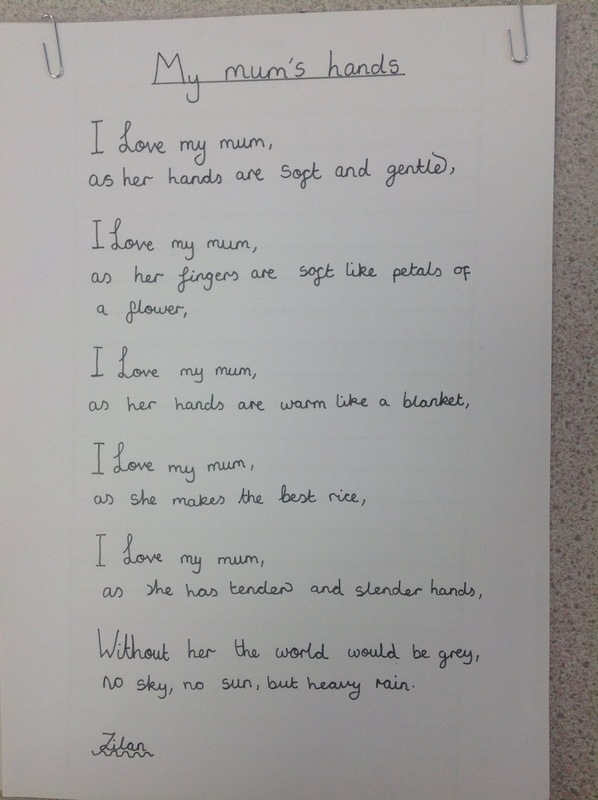 It was mainly mothers who came, the subjects of most of the poems. Everybody read beautifully. Most of the audience cried with happiness. 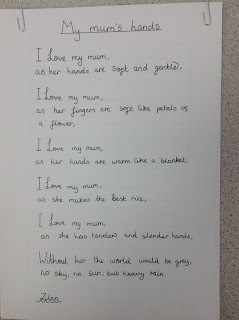 Year 5 at Weetwood Primary school shared their poetry today with classmates and parents. Poet James Nash introduced the sharing session explaining how the children’s writing was based on Walter de la Mare’s narrative poem ‘The Listeners’ where the young people had been invited to write from the perspective of the phantoms in the house. Year 5 had answered questions in the first person as if they were the listeners, the ghostly presence, in the old house. 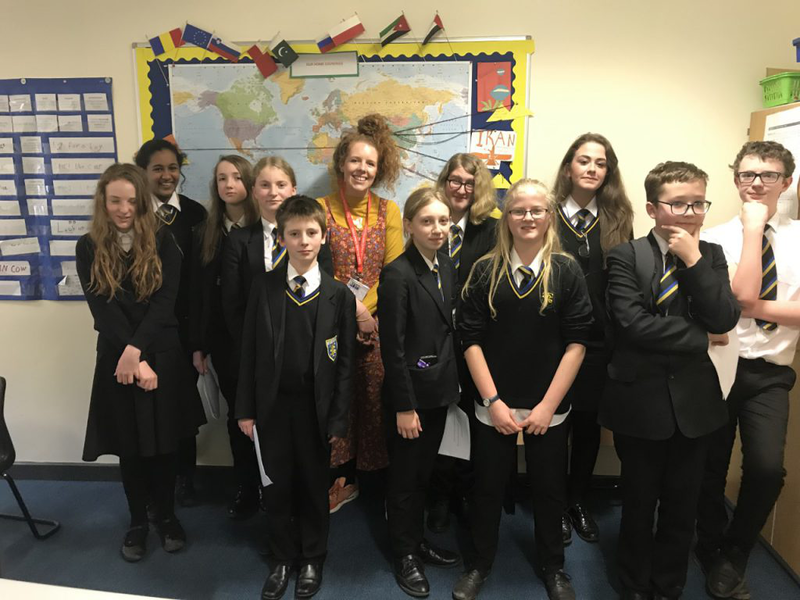 From there they had taken their initial ideas to a first or second drafts of a poem [ in one case five drafts] and then were all ready to share their finished pieces. 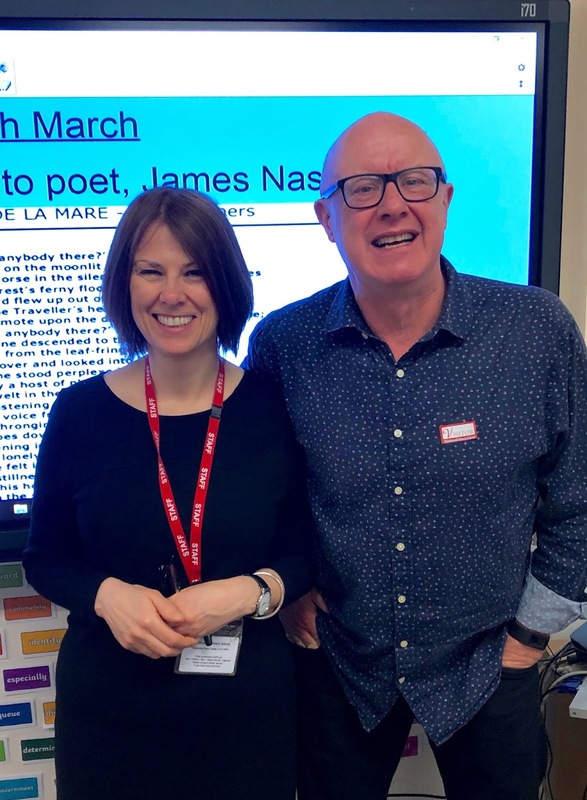 Class teacher Joanne Parker was hugely impressed at her class’s creativity, imaginative use of language and growth in confidence over the three sessions the young people worked with James. ‘listening to James talking about being a poet’. ‘My friends and family left when I caught death’. 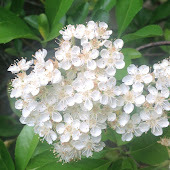 Want to write blog reviews or help at events? Send us an email. Be curious, amazed and pensive! Headingley is just the place for it! Don't expect a big circus with marquees, though: we're not at that stage yet. We're all volunteers as well. Our venues include the HEART Centre on Bennett Road, the New Headingley Club on St Michael's Road, friendly cafés, historic local cinemas, Headingley Library, people's houses and the historic Leeds Library in Commercial Street, city centre. Headingley has strong connections with many writers: Arthur Ransome was born in Headingley, J R R Tolkien lived at 5 Holly Bank and also at 2 Darnley Road, West Park when he was reader in English Language at the University of Leeds 1920 - 25, Alan Bennett lived over a butcher's shop opposite the Three Horseshoes, now Royale Dry Cleaners. Lucy Newlyn has published poetry about her early life in Headingley, George Orwell used to stay in Estcourt Terrace with his stepsister and her husband Humpy Dakin, T S Eliot used to visit his mother-in-law in Weetwood Lane, William Fryer Harvey was brought up in Spring Bank, Trevor Griffiths lived just off Victoria Road on Winstanley Terrace, Jon Silkin's first office of STAND magazine was his flat at 144 Otley Road, Sir Geoffrey Hill lived in Shire Oak Road, Peter Redgrove lived in Headingley between 1962 and 1965 when he was Gregory Fellow of Poetry at the University of Leeds, and Kay Mellor still lives near The Hollies in Far Headingley. Wilson Barrett, the charismatic first manager of the Grand Theatre, Leeds (a prolific playwright as well), lived in Beech Grove Terrace, Woodhouse in the 1870s. His house was a meeting place for many writers, artists and visitors to Leeds - such as W. S. Gilbert, George Grossmith and Atkinson Grimshaw. Headingley LitFest 2017 was the tenth. The eleventh one will take place in March 2018 - theme 'Happy Endings'. To receive all posts as soon as they appear, add your email to the box at the top right of the page.